Motorbiking is THE way to experience the countryside and people of northern Vietnam. Motorcycling through the mountains and fields is a very interactive experience, as everywhere you go people are smiling and waving to you as you pass by them! One becomes so much more accessable to the people on a motorbike, than if you where to drive up in a jeep. Something as simple as stopping in a village to talk with your friend, can turn into an experience, as twenty to thirty children swarm around you yelling "hello" and waving to you! The terraced rice paddies covering the mountains of Vietnam are truely mesmerizing! These people can grow rice anywhere. The limestone peaks carpeted with green jungle foilage are also very beautiful! The people are very friendly and curious about westerners, as they rarely see them in the more remote places our trip took us. Hill tribe traditional clothing can be very colorful and decorative. How they keep thier clothes so neat and clean is a real mystery, since they wear them to work in the fields and live in thatched huts with clay floors. 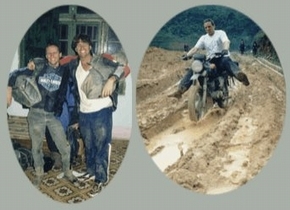 And the guides of Motorbiking Vietnam are no stranger to adventure, not letting a silly river or deeply muddied road get in the way of the journey! One can only wish that a video camera could capture this experience to share with others. But alas, it falls short, only able to inadequately capture stimuli for two of our five senses. When you book a trip with Explore Indochina, you are not only getting a guide to show you the way. You are getting an interpreter (really necessary in this country), a motorcycle mechanic, a staff photographer, and a fun travel companion who loves what he does! And I have great admiration for the level of respect the guides show for the impact tourism can have on a developing country. They choose to limit their tours to a maximum of four people, so as to be less intrusive on the native people as well as maintaining a more personalized feel to the trip. They also ride what the locals ride, a russian made motorcycle called the Minsk. By the end of my trip, I had developed a special love hate relationship with my Minsk. What a blast!